Two-thirds of a year. Sometimes it seems impossible that I’ve been without him that long - and that first anniversary moves inexorably closer of course. It’s been a real mixture of a month - I’m currently way in our - my - beloved Patsy and have, so far, had a really good trip. The second week of the month though saw the passing of his birthday - what would have been his 65th and something he was so looking forward to. It was a tough day. With no extra work I spent most of the day at home pottering and the mind inevitably wandered. 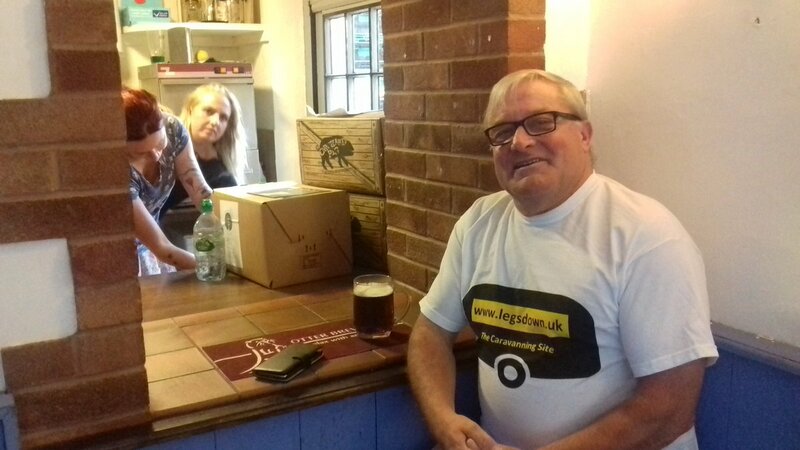 In the evening, after the school run I met with some friends for grog and grub and we had a nice evening raising our glasses to Trev. I’d barely opened the door of the flat though after and the tidal wave hit again, with a ferocity that took me quite by surprise. It passed of course, as always but blimey. You’re bumbling along, getting on with life, making the most of it and suddenly, without warning it hits you and you wonder how you’re going to get through the next five minutes. **Updated** This months pic sees Trev at the bar - quelle surprise - and I think he might have even paid too! It was at a delightful little boozer in Appley called The Globe Inn. It was 2017 - a difficult summer with his Mum in hospital and eventually having to go into a home. With her finally settled we headed off for a couple of weeks and stopped off at Gamlins Farm camp site on the way down to Devon where we met up with my cousin and his family.